504 pages | 105 B/W Illus. The study of the prehistory of East Asia is developing very rapidly. In uncovering the story of the flows of human migration that constituted the peopling of East Asia there exists widespread debate about the nature of evidence and the tools for correlating results from different disciplines. 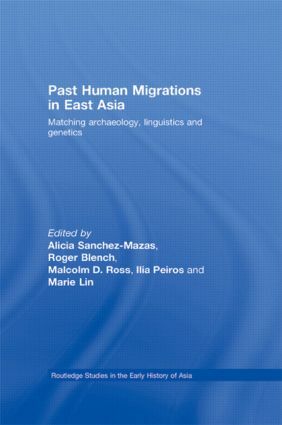 Drawing upon the latest evidence in genetics, linguistics and archaeology, this exciting new book examines the history of the peopling of East Asia, and investigates the ways in which we can detect migration, and its different markers in these fields of inquiry. Results from different academic disciplines are compared and reinterpreted in the light of evidence from others to attempt to try and generate consensus on methodology. Taking a broad geographical focus, the book also draws attention to the roles of minority peoples – hitherto underplayed in accounts of the region’s prehistory – such as the Austronesian, Tai-Kadai and Altaic speakers, whose contribution to the regional culture is now becoming accepted. Past Human Migrations in East Asia presents a full picture of the latest research on the peopling of East Asia, and will be of interest to scholars of all disciplines working on the reconstruction of the peopling of East and North East Asia. Alicia Sanchez-Mazas is Professor of Population Genetics at the University of Geneva, where she chairs the Department of Anthropology. Her main interest is the study of human genetic diversity and evolution. She has published many book chapters and papers, and co-edited The Peopling of East Asia (2005). Roger Blench is the Managing Director of a Consultancy and Research company, Mallam Dendo Ltd, specialising in development anthropology, especially pastoralism. He has long-term research interests in the interface of archaeology and linguistics and has co-edited diverse volumes, including Language, Archaeology, and the African past (2006). Malcolm Ross is Professor of Linguistics at the Australian National University and co-director of the Oceanic Lexicon Project. His interests include the histories of Austronesian and Papuan languages. He was a co-author of The Oceanic Languages (2002) and has published many articles on these topics. Ilia Peiros is Visiting Professor of Santa Fe Institute, USA. His main interest is the comparative linguistics of East and Southeast Asia. He has published several books and numerous articles. His current activity is to compile electronic etymological data-bases for Evolution of Human Languages project. Marie Lin is the Director of the Transfusion Medicine and Anthropology Research laboratory at the Taipei Mackay Memorial Hospital and a professor at the Institute of Forensic Medicine of National Taiwan University. She has published on blood groups, HLA, mtDNA and theY-chromosome in Taiwanese aboriginal populations.